As most frequent travelers know, airport security has become a bit of a challenge. You stand in endless queues, strip off belts, shoes and anything else that might set off an alarm, unpack your laptop, pour out your bottled water (this is something I’m particularly bad at remembering) and keep your fingers crossed that you get through in time to catch your flight. What would you do to experience shorter, quicker lineups, not have to remove your shoes or laptops and have no worries about making your flight? Have you heard about TSA Pre✓™? It’s a program which allows low-risk travelers to experience faster, more efficient screening at participating U.S. airports. Are you eligible to join the TSA Pre✓™ program? Enrollment in the program was originally very restrictive and was by invitation only. But requirements have eased up a lot and more and more people are now eligible to join. As a Canadian citizen who is already a member of NEXUS, I found out I was automatically eligible to belong to the program. Who else can join? 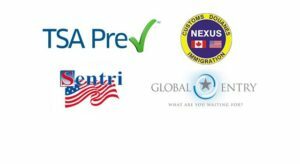 Any U.S. citizen who is a member of a DHS Trusted Traveler program such as Global Entry, NEXUS or Sentri, as well as Canadians who are members of NEXUS. Members of certain frequent-flyer programs are receiving invitations to join. Members of the military who use their Department of Defense ID number when making their airline reservation. The TSA recently opened up enrollment to any U.S. citizen who is willing to go through the enrollment process. This entails completing an online application, visiting one of the enrollment centers for an interview, background check and finger-printing and paying an $85 fee, good for five years. How will you know if you’re eligible to enter the Pre✓™ queue? Depending on which airline you’re flying, you may see “TSA Pre✓™,” “TSA PRE” or “TSA PRECHK” printed on your boarding pass. 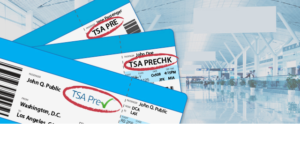 As some airlines don’t yet have the capability of printing this on your boarding pass, if you’re a member of a Trusted Traveler program or if you’ve opted in to Pre✓™ through your frequent flyer program, you should automatically proceed to the Pre✓™ queue. Having been fortunate enough to use Pre✓™ a couple of times recently, I highly recommend it. I loved keeping my shoes on and leaving my laptop in its case…if only I’d remembered to empty my darn water bottle it would have all gone as smoothly as it’s supposed to! Check it out!